. . . and babies make four. : On the first day of Christmas . . .
For years, long before we had children, I collected children's books. When we were waiting for our referral, I decided that I wanted to add bookplates to the front of the books I'd collected and quickly found out that cute bookplates are hard to find. And then I found Oiseaux. 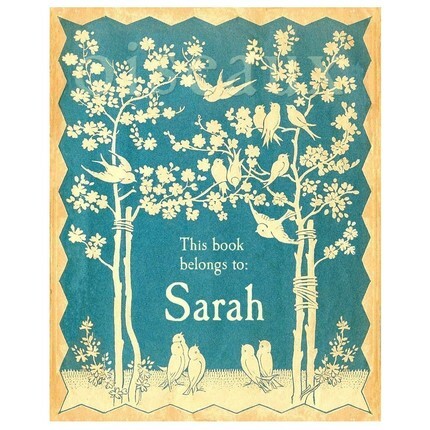 Oiseaux bookplates are designed by Shelley, an artist-illustrator-designer-painter-gardener who lives in a little cottage in the woods with her husband and 4-year-old daughter. They feature beautiful vintage images and can be customized with any name you choose. Oiseaux is offering one lucky reader a set of personalized bookplates or a personalized print -- so lovely too -- of their choosing. To enter, please go visit the Oiseaux etsy store and then leave a comment here letting me know which set of bookplates or print you would choose if you win. All entries must be received by December 7 at 12:00 midnight. Also, please note that the winner's selection will be shipped after January 1 since Shelley is already busily working on holiday orders. I LOVE these! I think my favorite is the "Vintage Girl Swinging." These are a great idea. Thanks for sharing. Thanks for this link to her Etsy store. Her bookplates truly are lovely! Adorable. I would have to say it would be hard to choose a design as they are all so cute, but I think I'd go with the vintage ring around the rosie. Also really like the vintage bluebird! LOVE them! Also wanted to let you know I just found your blog a few months back through another blog and I love it. Your girls are so adorable and I really enjoy and am inspired by your photography. I just got my first SLR about a year ago and still learning with it, your photography inspires me though! My choice would be the beautiful Vintage First Star Personalized Bookplates. We live in the south and this bookplate reminds me so much of the southern plantation houses around us. These are just lovely! I especially like the vintage Storytime. We live in a little woods and enjoy our furry friends oh so much! We also adore books. My husband's grandmother was a teacher and his mother is a middle school media specialist. We have many books from my husband's childhood on display. I plan to frame pages from his favorite childhood book and display on the walls! :) Great, great book plates! The singing animals ! Loved all of them though. Thank you for sharing this beautiful drawings. I will definitely get some of these - very charming. 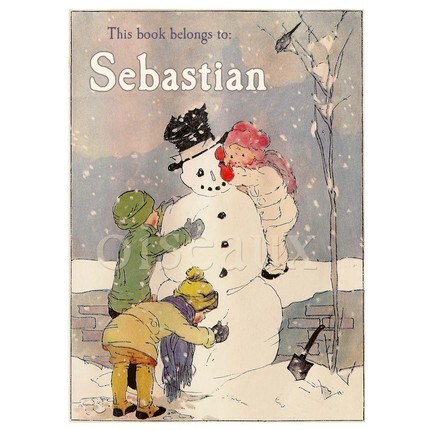 Love the ring around the rosy but the snowman would be perfect for our Christmas books. They are just darling! What a wonderful idea for the giveaways. I would be honored to be entered. I love The Sugarplum Tree personalized print!! The bookplates are beautiful, what wonderful talent. Thank you for sharing the spirit of the holidays! fantastic shop! I just shared her on my facebook page... I am so glad you have featured her :) I love the vintage spring clouds... but it was a hard choice to pick just one! These are just beautiful. I really like the one you have pictured as they would be perfect on Christmas books. I think I may order some for myself. Thank you for sharing. I would choose the Vintage Swing Plates, it reminds me of a picture my great-grandmother did of me when I was about 5 years old. It's the only thing I have from her. These are lovely! My favorite is "Vintage Fairies". Thank you for hosting the Christmas giveaways! Such a fun holiday activity! I love the Sugarplum Tree bookplates. Such a great idea! Kristi-once again you come up with a unique way to show your style. Thanks for the give-away. I LOVE to read, and so does Marissa. When I was a little girl my Grandpa (died when I was 4) called me T-Bird. My dad still uses the nickname. So, I like the Vintage Bird Bookplates since they remind me of my love of reading and have my "nickname" on them. Looking forward to finding new items and stores you enjoy! These are lovely. My favorite is the Vintage Sugarplum Tree. Thank you for hosting these fun giveaways; if all of them are as wonderful as this one, you will greatly brighten my holidays and introduce me to some terrific businesses. These are beautiful! I like the Assorted Vintage Little Boy Blank Bookplates. I, too, love and collect books. You're children and sense of style are gorgeous! You inspire us all. I'm not familiar with bookplates. Thank you for sharing this Etsy store. They truly are beautiful! After looking through all the amazing choices, I think I would choose the Vintage Ballerina bookplate. I have one very lovely ballerina that would adore placing one on her favorite ballet book. These are adorable! My favorite is the Vintage Ring Around the Rosie. I've loved reading your blog and it's nice to know there is another "Michal" around! How lovely! Each one is more beautiful than the next, but I would chose the Snowman bookplate -so perfect for our "Elf on the Shelf" book - a special surprise from Santa for our two China girls this year at Thanksgiving...the start of the first Holiday Season for our youngest. Thank you - this is fun! I love the Little Red Riding Hood plates. I love reading your blog, too. It helps the time pass as we wait for our baby. I would choose the sugar plum print. Beautiful. Thank you so much for working with such a fabulous Etsy vendor on this giveaway. There bookplates and prints are so gorgeous. The "Fairies and Flowers" are just beautiful!! what a great gift! I like the girls assortment...too hard to chose one favorite...thanks for the link! Wow, these are really neat. I like the hilltop tree one. There are so many amazing designs. I love the Sugarplum Tree book plate, its beautiful! I think I like the blue birds best, but wow, it's really hard to choose, isn't it? Vintage Night Owl Personalized Bookplates for my little Solomon!! These are so cute! I would choose the vintage bluebird ones. They are all awesome though. I'd definitely choose the "Personalized Vintage Blue Bird Bookplates"! These are beautiful! It's hard to choose just one, but I like the Vintage Bird plate. Can't wait to see what you share next! I'm with you on books, I can't help but buy buy buy! I used to be a kindergarden teacher so I have kids books galore! And I bought a book on China or Adoption each month while we waited for our Lilah Grace! Thanks for letting us know about these bookplates. They'll make excellent stocking stuffers. I love the vintage blue birds or the vintage lillies. Both stunning. What a great idea! I love the vintage lillies! Thanks for being so generous! Oh my -- those are all so beautiful! I think I would pick the Vintage Ring Around the Rosie print! What a fun idea! They are all so beautiful. I have never seen anything like this before. I would love to have a set of the Vintage First Star. Thanks for sharing. I LOVE, love, love the vintage blue birds!!! I love the Vintage Ring Around the Rosy book plates. They are all very cool, but I like seeing all of the different kids in this one! Thanks for hosting this fun 12 days of Christmas event. I love this idea and I would have to pick the bookplates of the tiger as that is what year my wonderful daughter was born in. she is a year of the tiger baby! So hard to pick a favorite. I loved the sugarplum, the vintage seaside and the prince and princess. I need to go back and look at some of the others people have mentioned...they are all very sweet. I missed the vintage balleriana. These are adorable! I would choose the "First Star" plates. Love these!!!! You find the best things. I would love to have the snowman ones. I am so glad I found this post....my mother needs these for her 1000+ books. You do the coolest things. Gorgeous! !My favorite is Little Red Riding Hood. Very pretty. I think my favorites are the blue birds. What a fun idea this is. Thanks. The "Vintage Ballerina" for my little ballerina, Camille of course! Vintage Hilltop Tree looks sweet to me. Thank you for your contest. These are beautiful! I've been looking for some bookplates, and these are perfect. My daughter loves to read and she has amassed quite a collection of books. Thanks for sharing the resource. I would choose the singing animals bookplates b/c they would combine all three of my daughter's loves -- reading, animals and singing. I love the vintage sugarplum print. I think "Vintage Little Red Riding Hood" is my favorite, but it's so hard to choose, they are all beautiful! Oh I love the Vintage Owl and Pussycat (a favorite book) and Vintage Blue Bird...but there are so many cute ones!! Wow these are wonderful. My favorite is wynken, blynken and nod. Wow my favorite is Wynken, Blyken and Nod. I am a sucker for fairies - so it would be woodland fairies for us! Thank you for arranging the great works of many talented women to be highlighted! My favorite is Ring around the Rosie. I am so excited tonight...my cousins were just approved for their little China doll..she is 3 years old and was on the waiting child list.....I think I have get start her with a book collection and these bookplates are the perfect addition! Thank you! Gorgeous Bookplates! I love the Vintage Bluebirds, but they are all so beautiful! Great find! Stunning!! Love the blue bird motif. These are great. My personal fave is the Vintage Twilight Flowers, though they are all gorgeous!!! Thank you for sharing. I've been following your blog for some time and have always thought you have such lovely taste. These bookplates are truly lovely, my favs are the Vintage Blue Bird Bookplates! Thanks for the opportunity! Lovin' me the Red Riding Hood. These are so lovely. I love First Star, but I also love Ring Around the Rosie. What a great idea "for the kids who have more toys than they can play with". I love it. Thank you. These are darling! I love the First Star the very best!! Love them! Love the "Ring Around the Rosie". Thank you-what a good idea! Lovely! I would choose the Hey Diddle Diddle ones for my Josiah. I would have to choose Vintage Woodland Fairies. What an enchanting site! I like the ring around the rosie print since I work with children (but don't have any of my own yet). Vintage Sugarplum. It is just lovely and I also happen to love trees. I would choose the "Fairy Garden"
..or maybe the "Blue Bird". They are all beautiful, but my favorite is the Sugarplum Tree. how cute! I love the vintage lillies! These are beautiful... Thanks for inviting the adopt twins group :) I love the vintage blue birds! I love them all but I would have to say the Personalized Vintage Blue Bird Bookplates are my favorite. Thanks for the giveaways....so much fun!!! The Vintage Bluebird design is beautiful! I in love with Vintage Ring Around the Rosie Personalized PRINT....AMAZING!! I really love the Vintage Blue Birds but it would be hard to choose because they are all so beautiful. I LOVE the vintage prints! Maybe the "Ring Around the Rosie", but it's so hard to choose. Thank you for showing us these beautiful things!! Oh how sweet! I think I love the Vintage "Ring Around the Rosie" set. Reminds me of my childhood. I might choose Hey Diddle Diddle, but I think "Tiger" might win. Both are from books I remember from my own childhood. Tiger especially reminds me of my grandfather. So hard to pick! I love the Vintage Rainbow! I love the Sugarplum tree's! I loved these for my two girls...my fave was: .Vintage First Star Personalized Bookplates...thanks for the links! So hard to decide, but I think I would choose the Owl and the Pussycat. Ring around the Rosie is my pick. These are such a great idea. Thanks. Kristi - Oh how exciting and what a wonderful idea!!! So I thought I would enter the give-away and then if I don't win I know where to find them:) Thanks for the great site! What a flashback! I remember most of my books as a child had personalized bookplates in them. It made me appreciate "my" books so much more. I would choose Vintage Ring Around the Rosie. For my little Amelia. I adore the vintage blue bird for my 8 year old twins who adore their books! while there are so many beautiful prints I would choose for myself (shameless I know), since I have 2 sons I would choose the vintage hey diddle, diddle....timeless classic! Love the Vintage Beach! These are so sweet! I love these adorable book name plates. I would love the Ring Around the Rosie. Hey Diddle Diddle is my favorate. My daughter's favorate nursery rhyme! Thanks. I would choose the sugarplum tree print for my little sweet tooth's bedroom. 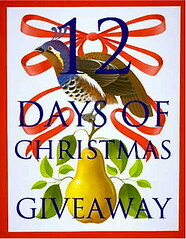 I'm getting lots of great shopping ideas from your 12 Days of Giveaways. You have such great taste and a knack for finding unique items. Thanks! These are so gorgeous and elegant. We love the 'kitty and girl' because we LOVE our kitties here at home.